How You See the Future Changes Everything! 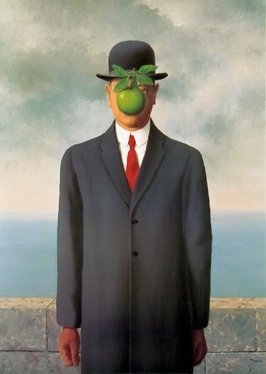 According to the artist, Rene Magritte, this is a self-portrait. I’m sure that was important to him, but that’s secondary to me. What’s primary to me about the painting is this: in “Clairvoyance” Magritte shows CLEARLY what a transformational change leader “sees” when they look at the future. “See” the egg. “Paint” the bird. Beautiful. Simple. Powerful. A picture worth 1,000 words. As you have probably guessed, “Clairvoyance” speaks to me — in a deep and meaningful way. But, I’ve discovered my reaction to the painting and the reaction from many others is not the same. Many people, maybe most, say something like — “Oh. Yeah. Okay. So?” Their responses are NOT like mine. Instead of “YES! Isn’t that amazing?! ?”, I get lukewarm reactions. Definitely not deep. Not meaningful. Why the difference? Is it me? It it them? Well, “Yes” to both. “How” we see the future is an individual thing, and I’m (in general) an optimistic, transformational type of person. I live to see the birds of life in the eggs I’m presented. When I come into a challenging, dysfunctional, low-performance work situation, I long to see the birds take flight. I dream, I believe, I call out the greatness within everyone, I describe a flock of birds, I engender hope. However, not everyone takes this approach. Metaphorically speaking, when some (far too many in my opinion) people are asked to envision a different future for themselves, they just see the egg and they can’t, don’t, or won’t see the bird. Their “vision” is limited to only what’s right in front of them. As such, their future will most definitely be unclear, uncertain, and therefore unreal. Unreal. Impossible. Not available. Seeing only what’s right in front of us is a clear indication of a “transactional manager or a transactional doer…” These folks won’t allow themselves to dream, they can’t see beyond today’s problems, and they don’t see the limitless possibilities available to them should the egg be transformed. They are stuck by their short-sightedness. Sound familiar? Sound impossible to crack? “NO!” I say… This is a HUGE opportunity for transformational change leaders (TCLs). Have you had a TCL in your personal or professional life — someone who has helped transform your short-sighted vision into something far more powerful? A coach? A parent? A teacher? A boss? I’ve enjoyed a wonderful working life as a keynote speaker — in part due to a boss I had VERY early in my career. He recognized something in me that I didn’t see myself, and rather than asking me if I’d like to be “on the agenda” and speak (about a topic I knew a fair amount about) at a major technology-related event, he just volunteered me. But then — rather than giving me “sink or swim” advice — he helped me see the egg in the situation (the “oh-my-god” feelings of dying on stage, or looking like an idiot, or getting pelted with rotten vegetables) and then he helped me transform it into the bird: profound feelings of accomplishment, of excitement, and the joy of discovering something that I truly LOVE to do. I remember him fondly to this day. Thank you Ross, wherever you might be. Extending Jack’s quote to TCLs makes me ask this question, “what’s the purpose of a TCL?” Yes — it’s to help others become TCLs, to see inside their eggs, to hear the stories about what’s coming next for their eggs, to begin to envision the “bird in flight” that will be breaking free in the future. What do you “paint” when you see an egg? Are you stuck — maybe only seeing a cynical future where the egg is paired with bacon and hash browns? Or instead are you able to be patient, to keep your eye on the long-term prize (the bird) even when little visible progress has been shown? 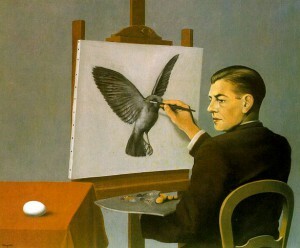 Paint like Magritte — see the egg, paint the bird. Help others to paint that way too — view today’s situation, and envision a new, better, improved, more excellent one. It’s the transformational thing to do. What’s It Like To Have Us Facilitate? “To see a master of it (facilitation) at work was great, I learned a great deal.